Roy Weatherby invented the 270 Weatherby Magnum rifle 1943 to be a part of his premium quality Weatherby rifle line-up. When it comes to 270 Weatherby ammo, the round uses the 300 H&H Magnum as its parent case in part because the 300 H&H Magnum can withstand very high pressure levels. The original cartridge was necked down to chamber the .277 bullet. As the name suggests, the round is proprietary to Weatherby rifles and does not have an official SAAMI maximum pressure limit. 270 Weatherby Magnum ammo is designed for long range, medium game hunting. The round is very capable of taking deer over long ranges, like those in the great wide open prairies of Texas and the American plains states. Hunters need to be very aware of shot placement with the 270 Weatherby ammunition (even more than other rounds) as taking a deer at long range with it can easily result in excessive damage to the meat as the cartridge is very powerful. 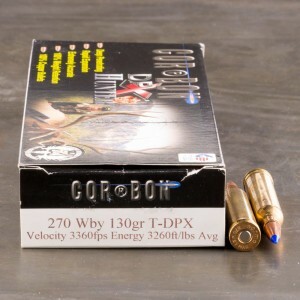 The 270 Weatherby Magnum cartridge is fairly popular, especially for a proprietary cartridge. The caliber is capable of pushing a 150 grain bullet at a very fast 3,161 feet per second.